I am making a coffee table (or whatever) that will have a 4' diameter glass top with sweet gum under it. It will be 18" tall. The base is 2 x 4 white oak 31 inches long in the form of an 'X' and the sweet gum will also be supported by a similar WO 'X'. The pedestal goes between the Xes and I need feedback on the pedestal that will support it. See pics. The pedestal is shown as a mockup made of pine but will be WO in the final version. It is 4 x 4 and 12.5" tall with a 2.5" square block at each end through which 4 knockdown bolts will be used to attach to the Xes. The blocks will be epoxied and screwed to the sides of the pedestal - top and bottom. 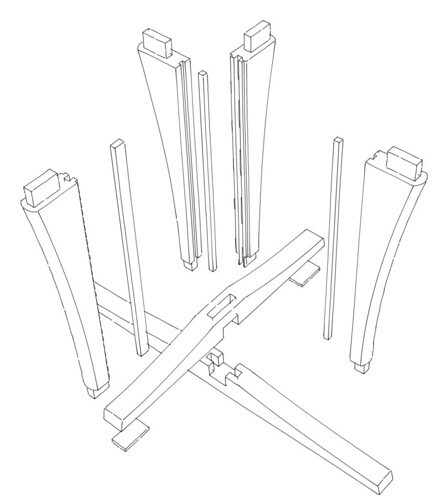 My concern is that a 4 x 4 base is pretty small and the hole pattern for the knockdown bolts is even smaller ~ 1.25 x 1.25 but on the other hand is white oak which is pretty strong. 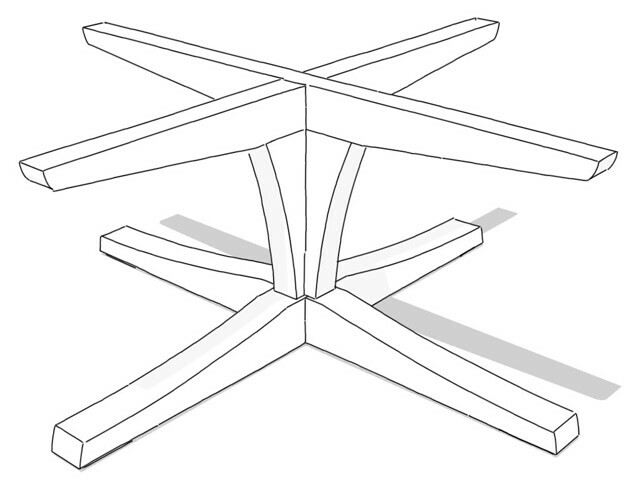 Is this an adequate design for supporting a coffee table? I usually over-build but a wider pedestal looks odd because it breaks the line of the supporting Xes. A 4 x 4 preserves the line. Comments welcome. Did you put wood strips in the top as fillers (pic 1)? That sweet gum is looking pretty good. The pedestal. You could make the support block a full 4" x 4" for better support and box it in with the 3/4" t trim pieces. A little awkward but there will be exposed edges however you do it. The box edges are mitered. How would you attach the solid block to the X's? I don't like to put screws into end grain because it just does not hold as well. I considered using a through-bolt down the center of the 4 x 4 and through the X's but I don't think I could drill it straight along the 12+ inch length. Yes, I did put oak strip fillers in the top. I wanted a darker wood for contrast but I used what I had but I will get plenty of contrast when the SG is finished. How would you attach the solid block to the X's? Are you really fixed on that design? oops, I should have cut the pine mockup so the end grain is up in the pic shown to reflect how I plan to do it with the oak. I plan to glue and screw the vertical faces of the pedestal to the face grain of the blocks. That leaves only face grain to attach to the Xs. So far. What do you see that prompts the question? I was just thinking that the pedestal you have kind of conflicts with the curves of the top. I was wondering if something more like this might work better. I really like those lines. I will have to mull over the joinery. You're welcome. The joinery for the table that inspired that pedestal is pretty simple. Splines to located the uprights. Tenons into the cross arms top and bottom. Dave has a really good eye for design features - I like that design much better - fits the top better. Interesting thought to revise Bob's original idea. The drawing above is befuddling me and I can't figure out how it goes along with " Splines to located the uprights. 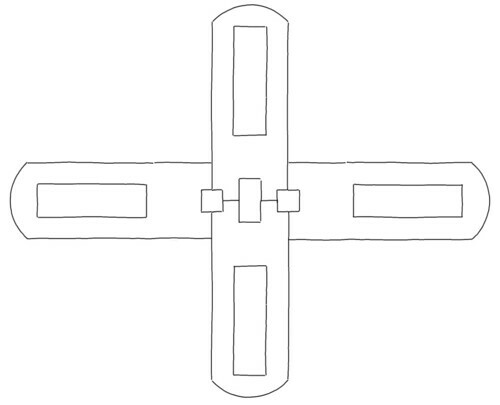 Tenons into the cross arms top and bottom." Guess I'm in a fog today after a week of rain, rain, and more rain. It'd be interesting to see this new pedestal with the actual top on it. Jeff, the small rectangle in the middle is a spline to aid in connecting the two pieces top and bottom, the little squares are splines to align the side pieces with the top and bottom ones in that view. The upright pieces of the pedestal are mortised into the feet as they are into the cross pieces under the top. This is an exploded view from the original dining table. Got it! Thanks. I don't think I have the skill set to do that but I at least understand now. You should at least give it a try. You'll learn something in the process. I will do it with 1/2"dowels. I'm familiar with them and have done a lot of dowelling and splining. Now that I have found the new website I will update those who have helped me along the way. Table is done (except for the glass) and I am pleased with it. I put a pine stain on the WO pedestal to go with the SG sapwood on the top. Thanks again to all who helped.